Alexa Quinn, now in her fifth year as principal of Friends’ Central Middle School, sees the middle school years as a time of profound transition, transformation and selfdiscovery— a time when students begin to learn who they are as learners and as thinkers, and how they relate to the world around them. Each grade presents its own unique challenges, so Friends’ Central crafts the experience accordingly. Sixth grade focuses on acclimating to a new campus, building confidence and using self-knowledge to “springboard a student’s education,” Quinn says. In sixth grade, students learn to develop executive-functioning skills, such as organization and time management, and they also begin to build “digital portfolios” featuring school projects upon which they can reflect and be proud. In seventh grade, students become immersed in deeper matters such as identity, personal development and self-advocacy; they gain the tools needed to become independent thinkers and learners, but also learn when to ask for help. It’s also a time for branching out. Early into the school year, for example, seventh graders travel to Echo Hill Outdoor School on Maryland’s Eastern Shore, where they spend a week studying environmental science and building bonds with fellow classmates. When students advance to eighth grade, they become the leaders of Friends’ Central Middle School, and one goal of the curriculum and programming is to develop their leadership skills. For example, eighth graders participate in self-driven projects, culminating in a “showcase” near the end of the school year. In the showcase, students share their individual academic, artistic and athletic talents in performances for the entire middle school, including students, parents and faculty. In years past, students have performed concerts to raise money for schools with fewer resources, created discussions similar to TED Talks, built a computer from scratch, and written cookbooks with prepared samples of their culinary creations for students to enjoy. Quinn says Friends’ Central Middle School “balances academic success with healthy personal development,” with a challenging interdisciplinary curriculum at its foundation. Quinn, who is also a Friends’ Central alum, credits the school’s teachers for making the curriculum come to life for students. “The way our teachers teach, we don’t share information and then ask to have it regurgitated back,” he says. “These students are entering a world where there are multiple truths, and they have to be able to navigate in an environment where they get information from many different perspectives. We want them to be able to defend their opinions but also to consider the views of others when they form those opinions. In today’s world, middle school students need to feel comfortable talking about difficult but essential topics. As an example, Terrell cites a recent student discussion about patriotism, relating to the controversy surrounding National Football League players “taking a knee” during the singing of the national anthem. Students find ample growth opportunities beyond the scope of the well-developed curriculum, including an affinity group program the school started eight years ago. Through these groups, students with common identifiers—racial identity, religious affiliation or family structure, for example— come together to discuss their similarities as well as their differences. As part of the program, members of each educator-led group also share their stories with the rest of the student body. 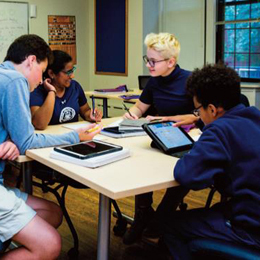 Students also learn and grow through service, an essential part of the middle school experience that’s rooted in the school’s Quaker tradition. Every Wednesday, students spend part of the day participating in various service projects, both on and off campus. These projects might include assisting at local preschools or retirement communities, monitoring the health of the stream in nearby Morris Park or creating content for the middle school newspaper, The Phoenix Inquirer.